So began a local journalist’s account of our PIT volunteers’ efforts to document the Eighth Creek Trestle, a historic logging-train trestle in dense forest near the old mill town of Westfir, Oregon. Ward Tonsfeldt, a history professor and railroad-logging expert, led six volunteers for a week in July 1998. They measured and photographed one of the best-preserved structures of its kind in western Oregon. 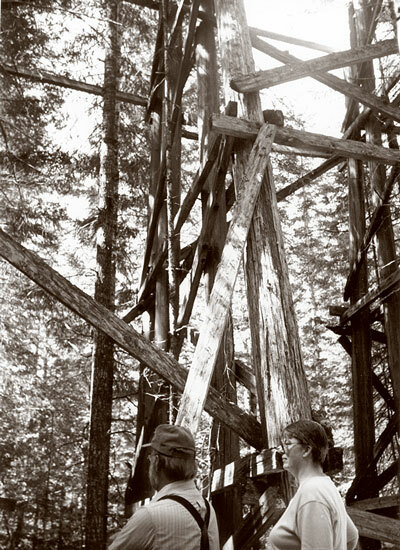 Spanning about 360 feet and rising up to 57 feet off the forest floor, the trestle features 30-inch cedar pilings and large wooden cross members held together with iron spikes. Built by Western Lumber Co. workers in 1929, the trestle was a vital part of a standard-gauge rail line that carried timber from Huckleberry Flats down a 72 percent in cline to the Westfir mill in the canyon below. Lloyd Palmer, noted railroad author and Suislaw NF employee, conducted tours during the project. Former mill workers came forth to give us a feel for “the way it was.” We were lucky to have a bona fide draftsman (all the way from Kansas) to assist with accurate drawings of the trestle. The volunteers were so skilled and enthusiastic that we had time to begin documenting Camp 3, a nearby historic logging camp where a PIT project is planned for August 1999. Time has taken a toll on the trestle, and there are no plans to restore it. But enough remains intact to reconstruct it through photography and measurements, which have been entered into a computer-aided drafting program, thus preserving it for future generations to study and admire. Dr. Tonsfeldt is preparing the forest’s documentation for the Historic American Engineering Record. And, not a moment too soon, for a month later, a forest fire came within half of a mile of our now well-recorded trestle!